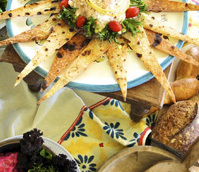 "Food, Glorious Food—and Fabulous Service"
"The Twin Cities has numerous talented caterers, but when a business occasion calls for inventive, perfectly prepared food and impeccable service, longtime caterer Cynthia Olson of Never Enough Thyme is always on pointe. Whether you’re planning an intimate sit-down dinner for eight C-level executives or a breathtaking hors d’oeuvres buffet for 50 out-of-town clients, Olson will always impress." "Never Enough Thyme is my first call for catering. I don’t have to worry about a thing. They always offer an interesting variety of food on the menu and I know that it will not only taste good, but will be presented wonderfully. Never Enough Thyme can be counted on for taste and appeal." "As an event planner, I must surround myself with the best talent to ensure that my client's special events exceed their expectations. That's why I turn to Never Enough Thyme. Their exceptional service is unparalleled and their beautifully prepared food is always delicious and artfully displayed. I am always in awe when working with Never Enough Thyme’s staff. They are delightful!" "We have enjoyed the wonderful food and service provided by Never Enough Thyme for the last 9 years. They have been consistent, adaptable and professional while presenting delicious food to our various hospitals and surgery centers. Our staff are always complimentary about the food, and look forward to the holiday luncheon each year. They are always delighted to hear the caterer is Never Enough Thyme!" "We love Never Enough Thyme Catering. Never Enough Thyme’s menu suggestions are always interesting, appropriate, and innovative. The food is excellent and beautifully presented, and the staff are professional, engaging and delightful. We have used Never Enough Thyme often and have always been thrilled with the results." "I have worked with Cynthia Olson and the Never Enough Thyme Catering staff for more than twelve years and nearly 100 events. They’ve created receptions for many world famous designers, architects and celebrities as well as our Grand Opening for 1000 guests. " 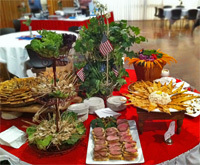 "Never Enough Thyme Catering always makes Gabberts look good! Their events are facilitated with grace, charm and artistry." 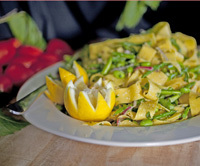 "Never Enough Thyme provides the most delicious and beautiful food options for our events. The food is always tailored to our customer, mirrors the spirit of each event, and has show-stopping presentation. We are so thankful for our partnership with Never Enough Thyme in creating amazing events for our customers!" "When some of my best friends leaned on me to hire a caterer for our daughter’ wedding celebration, I squirmed. Then one of my daughters suggested Never Enough Thyme Catering. Once I met Cynthia, I didn't have a moment's trepidation about the party set-up, the menu, the quality of the food or the service. The food was fresh, colorful, beautifully presented, memorably delicious, and there was plenty of it. Our family of 11 feasted on the leftovers. 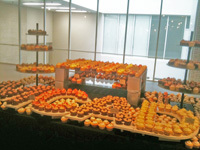 Never Enough Thyme Catering provided a solid foundation for our big event - with style! "